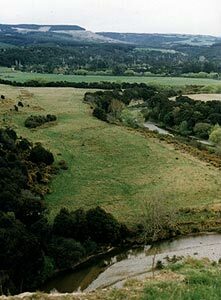 Waianakarua - (pronounced "Wai-anaka-rua"), is a Maori word meaning "Between Two Rivers" and refers to the area in general. 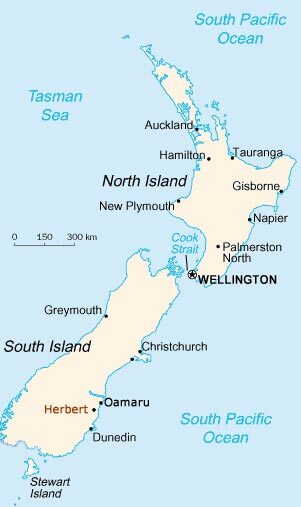 If you can find a map of Oamaru (which is approximately 100km North along the coast from Dunedin), Waianakarua is 20km south of Oamaru, and our cabin is 5km south of the township of Herbert and 7km inland. You reach it by travelling along Breakneck Road (nothing like as treacherous as it sounds!) and then turning left at the T-intersection down Reid's Rd almost until you run out of road... then it's 300 metres up a track into a paddock. Our cabin is 5 km south of the township of Herbert and 7 km inland. The area is a basin, surrounded on all sides by hills and cliffs and rather contradictory to the idea that being close to the sea is best for DX. 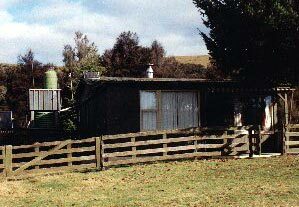 There is a steep bank running right above the South side of the property, not too far from the cabin, which has a pronounced attenuating effect on stations from the city of Dunedin, only 90 km to the South. 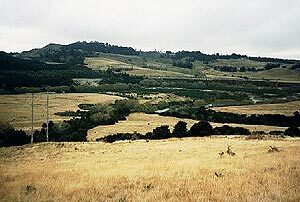 The north branch of the Waianakarua River defines the boundary of the area as it snakes it's way between high banks and cliffs, with the paddock sitting above and sloping eastwards towards a very high cliff. There is a lot of native trees and plants and plenty of bird-life, fantails, bell-birds and the odd tui. There are very few fish in the river, only ever seen one trout and one eel though there are several flounder. There is a significant number of 'pests', namely rabbits and opossums plus a few ferrets and feral cats, though no dangerous insects, snakes or other nasties save for the occasional sand-fly, which although considerably smaller than a mosquito, delivers an unpleasant bite. So, back to the pre-cut factory, working evenings and weekends to produce a pre-assembled cabin. My father is one of those clever types who can produce an intricate plan in his head, and the cabin was no challenge. Unfortunately, his aptitude for working with wood didn't filter down through the gene-pool to me! I was able to offer expertise in the wiring department, being a registered electrician and brother Wayne, a sheet-metal worker, was very handy to have around too. We all pitched in including brother Steve, with my mother, sister Sharon and my fiancée Linda providing sustenance and the finishing touches. The cabin is some distance from the nearest power supply, the 110kV lines were part of the national grid. So a 12-volt set-up was the only option... this meant a few less creature-comforts but a very rustic life-style. The battery is a deep-cycle type (after throwing out countless standard car, truck and even bulldozer lead-acid varieties) and trickle-charged by a 22-watt solar panel. 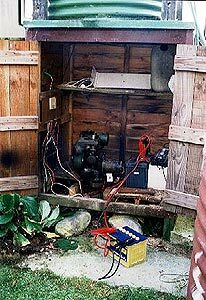 There is also a petrol-generator set using a Villiers pump motor, car generator & regulator. Water is rain-derived, taken from the guttering and stored in large tanks. We have a gas refrigerator and gas cook-top with a griller. There is a multi-purpose small wood-burning stove which provides heat and cooking as well as an LPG gas heater, kindly donated by the North Otago Branch of the NZRDXL. There is also a solar water-heater panel but it's very rudimentary and only works when there's plenty of sunlight... back to the drawing-board on that one! A cell-phone has supersceded a CB set for communications and the lack of a lap-top is could possibly be rectified in the future. There was an opportunity to test the area's DX-potential one weekend. I took my Kenwood R-1000 mobile and hooked up a nearby fence as an aerial... the results were rather disappointing and I wasn't holding out too much hopes of the site proving good DX-material. Building the cabin went smoothly with the exception of when it came to digging holes for piles, fence posts etc as the ground was very stony. All was finished in time for Easter of 1982 and my parents were the first to stay there. I had booked in for May, a month before Linda and I were married. My plan was for a long weekend of three nights, taking the Friday off work and for plenty of SW DX, after all, the first test had shown MW to be bad and SW a little better. Undaunted, I decided that a Beverage aerial was still worth erecting so it was to be my main aerial. I arrived late morning and proceeded to run out a wire down in the area my compass told me was Lima (allowing for magnetic corrections). The wire was 350 metres long and averaged 1.2 metres high. And I discovered that those power-lines weren't going to be too much of a problem for MW anyway. On a damp, drizzly night you could discern a background buzz, however on SW the noise would totally wreck reception of anything but the strongest stations. On one occasion, they had been creating considerable noise for a couple of days and the next day was the R St Helena broadcast. In desperation we went to the very opposite end of the paddock, close to a kilometre away and threw an aerial up into the trees... and they were still creating havoc! Next day's reception of St Helena was subsequently spoilt though I'm happy to report better reception in later years. And I was very pleased when I heard that the power-lines would be dismantled as the cost of upgrading them was prohibitive with other lines many kilometres away being reconfigured to take the load. So since 1995, SW has not been plagued by that dreaded buzz! Plans for extra Beverages in different directions were advanced, thankfully some were permanent thanks to handy trees and bush, the first Latin aerial passed over tracks and grazing land so to this day, it has remained temporary. 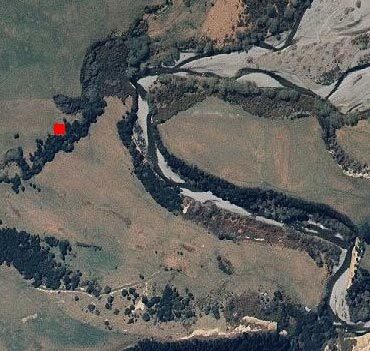 In September 1983, the first North American aerial was strung across trees and a corner of the adjacent paddock, across the Waianakarua River, over a real rough peice of ground covered with all sorts of nasty prickly plants like briar, black-berry, bush-lawyer & gorse. The bearing is about 75 degrees which made it ideal for Mexicans and the East-Coasters, particularly Florida. Mark Nicholls was visiting and I'm not sure if he would have come known the amount of sweat and blood he would have exuded putting up the aerial! It remains till the day and has a second aerial alongside.. every now and then, one or the other comes down and it's back to that cursed bit of land with a slasher and gorse knife to get the aerials up again. Alaskan stations have always been an attraction and I needed an aerial in their general direction. Firstly, I could only muster 165 metres first constructed in 1985. This produced a few of the stronger stations like KNOM 780, KFQD 750 & KYAK 650 but I needed something a bit longer. On an angle of about 20 degrees from the cabin, there is a couple of gullies within 40 metres, easy to overcome with my 4 metre surf-caster fishing rod, then a 150 metres of over-grown gulch running about parallel with the intended wire direction, also covered with the aforementioned plants. A bit of aerial 'fishing', sweat and effort produced an aerial approximating 250 metres, the rewards for which were some lower-powered Alaskans and plenty of Hawaiians. Next up was a wire aimed at the West Coast of the USA, and a bearing of 50 degrees. This wire crossed trees and the adjacent paddock and a bit more fishing took it over the corner of totally impenetrable scrub-land absolutely covered in gorse... an army patrol could be lost in there for days! Then across the Waianakarua River into some willow trees to a termination and earth-stake. This wire had never been very successful, even when I added another 100 metres in the reverse direction. Terminating the opposite end has since given me an aerial which is effective for Middle-East and European signals coming on a near-polar route before sunrise. I really needed a permanent Latin aerial so the placement of trees etc was looked at. 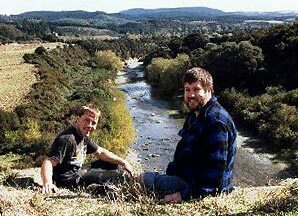 The Waianakarua River ran in roughly the right direction so Mark Nicholls and Bryan Clark were "volunteered" into erecting a 600 metre aerial which ran down the Southern side of the aerial, travelling for a great part over trees, dropping down to a river flat, across more impenetrable scrub. At the Latin end of this aerial was a cliff of about 40 metres, so we walked the wire straight down the middle of the river for about the last two thirds of it's length, then climbed the cliff, fished the end of the wire up to the top of the cliff and strained the wire as much as possible, dragging it across to the South over the river-flat.. Then the "volunteers" would go into the scrub as far as possible, poking the wire above the bush and the strain was adjusted as the wire straightened. This task took all day so it was with some anguish that we discovered it wasn't working too well! The temporary aerial ran rings around it... after all that effort we weren't about to rip it out so it was left in place. I thought it may be too close to the 40 metre cliff at the end so after 12 months and then Mother Nature forced my hand... a flood ripped out 200 metres of the wire... so I replaced it... then a small scrub-fire incinerated it... so I changed tack and ran it along the top of the paddock in trees... it was about 425 metres in total.. would it be any good? Yes!! Have made some exceptionally good logs on it since. It still isn't as good as the temporary 475 metre wire which is dead straight, but it ain't too far away from it. Mark Nicholls & I after dragging the wire down the river. One of the difficulties in getting into the paddock where the cabin was, is that when it rained a lot of water congregated in a natural channel where the road/track was. The muddy creek would break it's bank up from the cabin and a new creek would appear very quickly... I nearly got bogged several times so a new approach to the cabin was needed. This ran alongside a fence... with tanalised wooden posts and Number 8 wire. 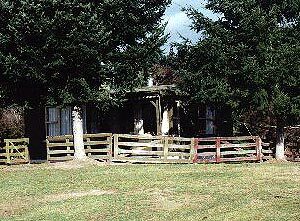 It's potential as an aerial was quickly utilised though it did need a short temporary section from where the fence stopped 40 metres short of the cabin. It is on a bearing of 355 degrees and is very good for Pacific, Japanese and Korean stations... unfortunately for New Zealanders too... the majority of which are North of Waianakarua... still, it's been a valuable aerial and has produced a number of Japanese stations even some peaking over co-channel New Zealanders. One point of interest, the top wire which is used as the aerial, is fastened to the tanalised (a chemical treatment to ensure long-life in timbers buried in the ground) posts by metal staples. Andy Gardner suggested on one of his visits that the chemicals in the posts may cause some conductance to ground... a quick check with the multi-meter revealed he was correct so we fashioned some insulation from coax cable to isolate the wire from the timber and succeeded in substantially lowering the overall resistance of the aerial. 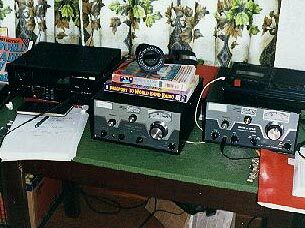 Over the years there have been many different brands of receiver adorning the tables at Waianakarua. I started with a Kenwood R-1000 and soon modified it by removing an attenutation section and adding a Radio West 1.9kHz filter. It stood up well against the Sony ICF-6800W and even the Icom ICR-70, and ran rings around the various Yaesu & Lowe receivers. In 1985 I swapped the R-1000 for a Drake SPR-4 and have been using the same set ever since. When you're running on battery, any set that draws an amp or more places a fair amount of stress on the battery supply and the relatively high minimum operating voltage of some sets was also a problem as the batteries output voltage started to drop - the SPR-4 draws very little and still percolates well down below 9 volts! The Drake R-8 draws an amp when it's switched off(!) and 2 amps when it's running, so fine set that it may be, it needed a set of batteries of its own and at least one good top-up over a week. The R-5000 recievers impress too, running around an amp and also with improved MW performance when modified. The ICR-71 and NRD-535 are great sets too... but I was still left wondering what I would do if the trusty SPR-4 expired, short of buying another one... until Bryan Clark arrived with his AOR 7030+... a superb little machine that looked inocuous yet delivered substantial signals in a wide number of situations, so much so that an AOR 7030+ would be the top of my receiver shopping list. A word about coax and baluns etc... for may years my Beverages at Waianakarua were fed by open wires, I fashioned some rude aerial switches using bolts and alligator clips... the biggest draw-back was interaction between receivers using both the same and different aerials. Suddenly you'd lose a station because someone else had connected to a different aerial of changed from MW to SW etc... bit of a pain but heck, we never came to blows over it. My answer to that problem was to put up another aerial hence there are now four aimed at the USA, one at Central America/Caribbean and two for South America. Generally I can accommodate three DXers without too many aerial-sharing hassles though splitters are under consideration. I read about baluns and built a few using toroidal cores from a New Zealand firm... they weren't to the specification I wanted and ended up performing poorly, so it was back to open wires! Then I read about Shawn Axelrod & John Bryant's success so decided to follow their pattern methodically and imported some balun cores from Amidon in California. This brought great results... no more interaction, tighter aerial patterns and better signal transfer I'm sure. The baluns are fitted at the head of the coax then run back to a metal box close to the receivers and are terminated on BNC sockets. Receivers are connected via leads with BNC plugs on and for ease of connection, the lugs are filed off either side of the sockets (thanks for that tip - and the sockets, to Andy Gardner). After 17 years of DXing from Waianakarua, the the luxury of directional Beverages to negate interference from New Zealanders and Aussies was suddenly not enough. I was getting to the stage were I needed another edge and had played around with an R-L-C phasing unit as made popular by USA DXer Mark Connelly. I was finding some succes with the unit though finding reports from overseas DXers about the merits of the MFJ Enterprises units had me wondering how effective they might be. Invercargill DXer Steven Greenyer was very pleased with the results of his MFJ-1025 phaser (MFJ-1025 review) and I expressed interest in one myself. Thanks to Steven and fellow DXer Arthur Williams, I was able to pick one up from a ham operator's deceased estate (MFJ-1026 review). Suddenly the phaser opened up new opportunities not only by being able to phase out interfering New Zealand stations but also by being able to combine two Beverages and getting a signal gain! Now there is a Superphaser, heralded even more highly than the MFJ so I'm sure I haven't come to the end of the add-ons yet! And I've had the company of many DXers over the years. Mark Nicholls has been a regular, as has Bryan Clark and Harry Weatherley who has made the journey several times from Australia. Others to spend a night or two at the dials include Andy Gardner, Tony Magon, Chris Martin (also from Oz) and Steven Greenyer. 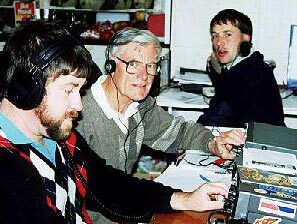 Many others have dropped in for an evening and several local DXers can be found escaping their local QRM, the most regular are Basil Jamieson, Peter Grenfell and Ray Davey. MW: There are two paths open to Europe. Around the solar minima long-path Europeans make the journey around sunset which often coincides with sunrise in Europe thus giving a true Greyline enhancement. Europeans are on 9kHz spacing just as we are, and there are not very many clear channels in NZ now. 1107, 1323 & 1485 are the best chances yet when the long-pathers are really strong, like in 1996, they will be easily heard over NZ stations. The locals are also not very strong at this time of the day and Australian stations don't fade in for another couple of hours. The other path is the opposite with sunrise here and sunset in Europe though it's very rare to hear Europeans via this path nowadays as they need to be able to climb over strong New Zealanders and Australians. SW: Europeans are very well heard here with many sub-50 watt European pirates making the trip. MW: Without a doubt, Africans are the hardest to hear. The propagation paths are very similar to Europeans only the signals pass much closer to the Poles and suffer heavily from any auroral activity, especially from anywhere South of the Sahara. SW:Things are different, reception best in our mornings with some excellent tropical-band openings around our sunrise and early evening Western Africans heard most the year round, with a short trans-polar opening into Southern Africa possible mid-Winter from 0430-0530z (4:30 - 5:30p.m.). I've thought that the latter is a possible MW propagation path but so far, nothing has materialized. MW: Only one propagation path here... around our sunrise though they can be heard at lower levels around an hour prior. Saudi Arabia 1440 used to be an early-bird though 2 New Zealanders on 1440 now make that less likely. A combination of the Equinox and solar minima has resulted in signals from Jordan, Yemen, Syria & Saudi Arabia flattening NZers at times. SW: The Middle Eastern stations romp in here, best on the higher frequencies mid-afternoon and lower freqs through early and mid-morning. MW: One propagation path but a long one. Asians first fade in around 3 -4 hours after local sunset depending on the time of year and will be present right through to our sunrise. SW: Our proximity to Asia means reception is possible for 24 hours a day... a similar reception pattern to the Middle East. MW: Strangely enough, South Pacific stations don't feature strongly down here. May have something to do with where their hops bounce but it isn't often we get good, steady strong signals from our Pacific neighbours. There are some good early morning openings around 2-3 hours before sunrise for northern Pacific stations like Guam and Hawaii but it's very seldom that we ever hear South Pacific stations outside of our evenings. SW: A little like MW in that Kiribati, when active, should romp in here even if it is 500 watts though it took me quite a number of years to hear it. Unfortunately there are fewer and fewer Pacific SW stations on air now. MW: Two good times to hear these are mid-evening and mid-morning. The latter coinciding with their sunrise, arounnd 2 - 5 a.m. and after all 10kHz channels have been vacated by daylight fade-outs of Canadian & US stations. SW: Both KWHR and KNLS are very strong here though the latter can be subject to ionospheric fade-outs. MW: We get prolonged periods when Mexicans totally dominate the dials during our evenings... 1kW Mexicanos can clean out usually-dominant 50kW US stations with regularity. A lot of NZ DXers consider them pests however I enjoy their various musical styles and QSLing as many different States as possible is a target of mine. SW: R Educacion is a potent signal here though aside from XERMX, XEOY and the rare appearance of R Huaycocotla, there isn't a lot of activity. MW: I'm not sure what it is about Central Americans... they've never been that good! Ever now and then a window will open for a short length of time. Really strange as Mexicans are usual fare! I've heard every Central American country but nothing into double-digits for some obscure reason. They're best around sunset here and their sunrise too though the odd mid-evening window is just as likely to pop up. SW: Whilst MW Central Americans are relatively poor, their SW counterparts aren't. Traditionally good signals are heard. SW: Though there aren't many Caribbeans on SW these days, they have also been a regular force and no trouble to hear. Listening to R Grenada relaying test cricket on the 19 mb around 2100 (9a.m.) back in the late 70's was a real treat. MW: Of all the geographical categories, Waianakarua delivers South Americans best of all... and if you stood at the West end of the Latin Beverages and looked directly down the wire, you'd wonder how on Earth could they get past those hills and cliffs to the East! I've heard 100 Colombians, 50 Peruvians, 40 Venezuelans and 30 Chileans though only half a dozen Ecuadorians and two Bolivians. Argentines, Brazilians, Uruguayans and Paraguayans are the real treats and I've heard plenty of them too! Guyana is the only South American country I haven't heard. In mid-Winter, the Latins can be heard from around 0300z (3p.m.) up till the last Peruvian fades out around 1100z (11 p.m.). SW: Very similar reception patterns to MW except that in mid-Winter, signals from Brazil can be heard on the 60 m.b. 5 hours before sunset! Even though Brazil is the eastern-most country, for some reason their signals are very powerful here, 31 and 25 metre-banders can be heard from 2000z (8a.m.) past 1100z (11p.m. ).